Determine if You Should File For Bankrupty! The client is the most important thing at the law firm of Hendricks & Larsen, P.C. 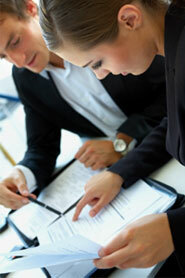 Unlike other law firms, our attorneys are always available to speak to the client. While clients may not find personal attention with other law firms, they will find it with Hendricks & Larsen. Our attorneys go the extra mile to be available to all of our clients and potential clients. They will often take phone calls or return emails well outside of normal business hours. Our clients are never disappointed with our representation and availability! The law firm of Hendricks & Larsen, P.C. is dedicated to representing individuals and business throughout the great state of Utah. Our experienced and knowledgeable attorneys enjoy guiding individuals and businesses through the hard times that life often presents, such as divorce, custody issues, bankruptcy, criminal charges, personal injury, employment issues, etc. In addition to taking care of our clients during hard times, our attorneys are also there for individuals and businesses through life's good times, such as adoption, business transactions (Creating new corporations, partnerships agreements and contracts) and obtaining visas. The attorneys of Hendricks & Larsen, P.C. fully commit themselves to each one of our clients in the most competent manner possible. Our attorneys are highly qualified professionals who realize that the "legal world" is often a scary and complex place that few clients really understand. Our attorneys go well out of their ways to help our clients feel comfortable during their litigation processes and to give them confidence that their rights are being protected or their transactions are being completed in the best possible way.